(24" x 14" x 9"), c.1990's Provenance: Private collection. Current owner purchased in New York in 2004. (18" x 7" x 7"), c.1990's Provenance: Private collection. Pierrot Barra and Marie Cassaise at their shop in the Iron Market, Port-au-Prince. Photograph by Doran Ross, in Vodou Things: The Art of Pierrot Barra and Marie Cassaise, Donald Cosentino University Press of Mississippi, Jackson, MS, 1998. 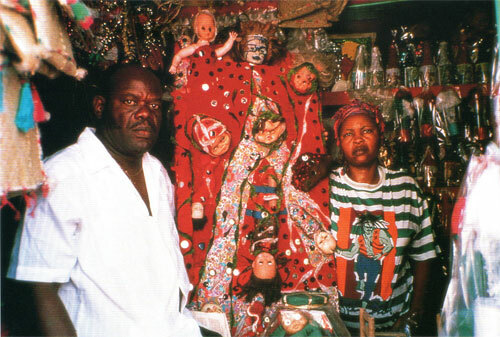 Pierrot Barra (1942-99) worked with his wife Marie Cassaise, from Port-au-Prince’s Iron Market, Haiti, creating Vodou repositories from toys, fabric, glass, sequins, goats' horns, rosaries, costume jewelry, compact mirrors, Christmas ornaments, crucifixes, and other discarded materials. His works were inspired by dreams sent by his divine mentor, the lwa or spirit Ogou, and were primarily intended to serve as ‘little altars’ for the diverse members of the Vodou pantheon. Syncretising West African spirit religions, with Catholicism and freemasonry, Vodou was covertly developed by slaves in Haiti, and was said to be a cohesive factor behind the revolution that secured independence for the world’s first ‘Black Republic’. Of all the Iwas, LaSiren, water manifestation of Ezili, holds the deepest affection for Vodou practitioners. Like Mami Wata in West Africa, and Iemanjá, her Brazilian and Cuban counterpart, she is associated with the Virgin Mary, as well as with mermaids and sirens. As explored in Barra’s work, her offerings often take the form of boats laden with flowers, perfumes and Barbie dolls, in recognition of the Atlantic Ocean’s duality as a site of both burial and death, and of fertility and rebirth. Barra lived and worked in Haiti.